Why is it that once December arrives Christmas is suddenly upon us? Every year, Mama and I say that we’re going to start our Christmas sewing and craft after Easter. But we never quite manage it. I’m determined for things to be different in 2015. Perhaps if I host a ‘Christmas In July’ challenge, I might get something done? Any takers? Just as well all of these felt Christmas projects are really quick to make and super simple too! And most of the patterns are FREE!! Don’t you love it? So I’ve still got time to make up some more of these pretties. Sew this lovely felt mouse and her sweet little stocking to hand on the tree. I have a full tutorial HERE including a printable PDF pattern. This felt ornament was super simple to sew. Read more HERE. These lovely felt decorations were inspired by another clever blogger, who has a whole range of patterns for these adorable pieces. I wrote about them HERE. These Christmas Spice Pillows are just one of a whole list of sweet Christmas creations you can make with your kids. Click HERE to see the whole collection. This little angel decoration even has a tiny treat pocket on the front, so you can put special treasures inside. There’s a PDF pattern and more over HERE. This lovely felt pear pin cushion was originally inspired by a ‘Partridge in a Pear Tree’ Christmas project. You can read about the project and where to buy the pear pattern HERE. The partridge bird pin topper is just a little something I made up to go with it! For tips on working with wool felt, you can read more HERE. 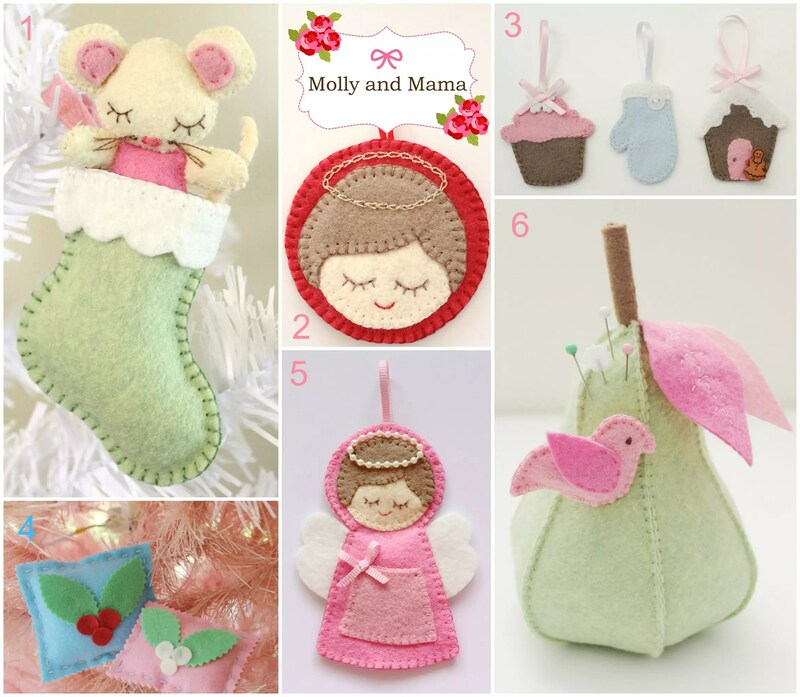 I’d love to see what you create so feel free to share on the Molly and Mama Facebook Page. And I’m always happy to pin your gorgeous creations to Pinterest too! Happy Christmas crafting and sewing. If you come across some adorable patterns and templates, be sure to share them!